So we’re at war, remember? So I’m trying to educate myself with the science of light bulbs. I like lights to be on and I like them high quality so I can clearly see. Though in order to be environmentally friendly one seems to have to sit in poor light. Eco-friendly bulbs seem to give off inadequate light (luminosity), poor quality light (a narrow frequency range) and some of them annoyingly turn OFF (and on like a disco) when it thinks there is sufficient light. 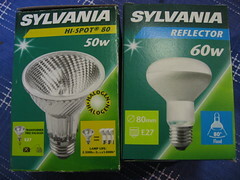 I prefer the conventional reflector bulb, which costs just 1 GBP and the halogen is 5 GBP. My father says the conventional bulbs last just as long as the halogen ones, despite the advertisements that the halogens last longer. I don’t quite believe my father, though lets assume that halogen bulbs last three times longer than conventional bulbs. They’re also 5 times more expensive! About energy efficiency. 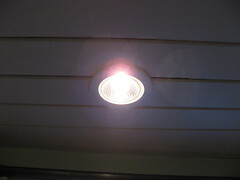 The conventional bulb is 60W and the halogen 50W. Does that mean the conventional bulb consumes 10W more energy? I am not sure, as I am reading about halogen lamps to discover they’re very inefficient. 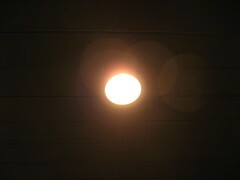 And what is 10W with the superior quality of light of a conventional bulb? The Compact fluorescent lamp is supposed to be most efficient, but it is well known they give a poor quality of light. My mother sometimes makes classy lamps and she says Compact fluorescent lamp’s bulky design and the light they give off is not good. I assumed LED lights were better because of their durability and long battery life. According to Wikipedia LED bulbs produce more light per Watt, though if they get too hot, they’re life span quickly goes down so they get expensive when they start to produce more lumens (light intensity). In conclusion I prefer conventional bulb’s quality of light compared to the ‘efficient’ Compact fluorescent lamp and I hope to replace expired halogen bulbs in the house with conventional bulbs. Also light bulbs are really complicated and I think we’re losing this war.